Because Hawk Hill has frontage on a busy road in a suburban area, I have my horses wear leather halters 24/7. I once watched the comical-had-it-not-been-so-scary struggle of a highway patrol officer trying to secure an unhaltered horse running loose on a highway and that experience convinced me that having a fast, secure way to catch my horses is safer for them. Needless to say, with constant use, I end up doing MANY halter repairs. I’ve learned to repair a lot of halter breaks that most people think would send the halter straight to the trash or a professional leather repair shop (By the way, never trash a leather halter when there are so many cool ways to repurpose halters). Today I’m demonstrating how to repair a single-buckle halter with a broken crown. Single Buckle Halter/Crown: Includes just one buckle on the crown, located on the “near” side (i.e. mounting side). Buckle hardware is one of the most expensive parts of the halter, so economical halters usually just have one buckle. Double Buckle Halter/Crown: Higher end halter or halters sold as “breakaway” often include two buckles- one on each side of the crown. Double buckle halters make a broken crown a super easy fix, since the broken piece can be removed by unbuckling both buckles, and replaced easily. When the crown on a single buckle halter breaks, most folks assume they’ll need professional repair, but today I’ll show you a cheap and easy way to convert a single buckle halter crown to a double buckle crown, resulting in a no-sew fix! This method also repairs double buckle halters if the broken section of the halter is one of the buckles on the crown, the crown, or the tabs that connect the crown buckles to the rest of the halter. My selected patient: a black 3/4″ wide horse halter with a crown broken near the O ring on the off side. 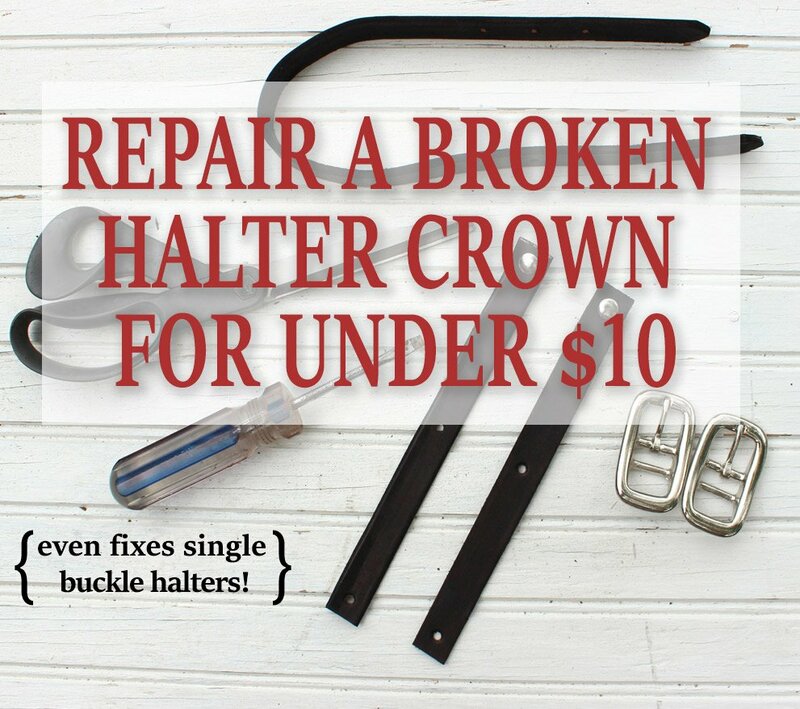 Your local tack store probably won’t have all these items, but if you can’t salvage them from old halters you can pick them up at luckypony.com for a fraction of the price of a new halter. 5. (optional, as needed) leather dye to dye pieces to match halter color. 6. (optional) superglue to prevent Chicago Screws from loosening over time. Cut crown entirely away from halter. Remove the crown strap where it connects to both Cheek O Rings. Prep your buckles and breakaway straps. Slide your strap up and over the straight bar on the buckle, making sure the finished side of the leather is facing when you look down at the buckle from on top. **if you hate checking for loose chicago screws, just add a drop of superglue to the threads during this step. Buckle on the crown to your newly attached buckles and you’re done! A fatally wounded halter returned to fully functional condition! Did you find this tutorial helpful? I’d love to hear from you about what worked and what didn’t! What small leather repairs are you currently searching for a solution to?